We stepped out of our tiny world on Monday and headed into NYC for a big day of work and play (they’re often the same thing). One of our stops included seeing the wonderful people at Sullivan Street Bakery and saying hello to the brilliant owner, Jim Lahey. We brought a big loaf of their irresistible filone back to Canal House for lunch. 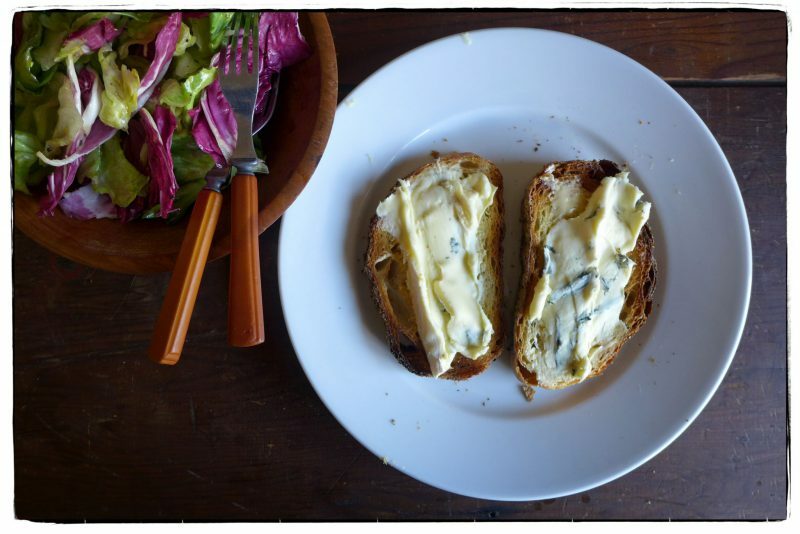 So today, we toasted thick slices of the chewy bread, slathered them with salted Irish butter, and spread Fromager d’Affinois Bleu on top. Heaven, even two days later. These early spring days are so beautiful. 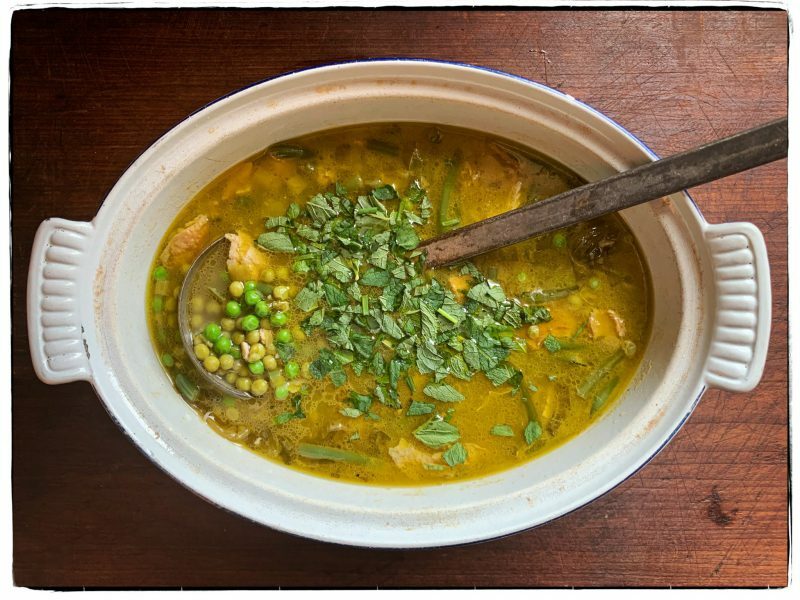 They make us eager to start cooking with asparagus and peas, but we are still weeks away from feasting on local varieties. We checked in with our friend and forger Tama Matsuoka Wong (meadowsandmore.com) and she says that nettles will be up in Pennsylvania this weekend. We might don our rubber gloves and go for a hike along the canal in search of the green leaves so we can make a potage with them. 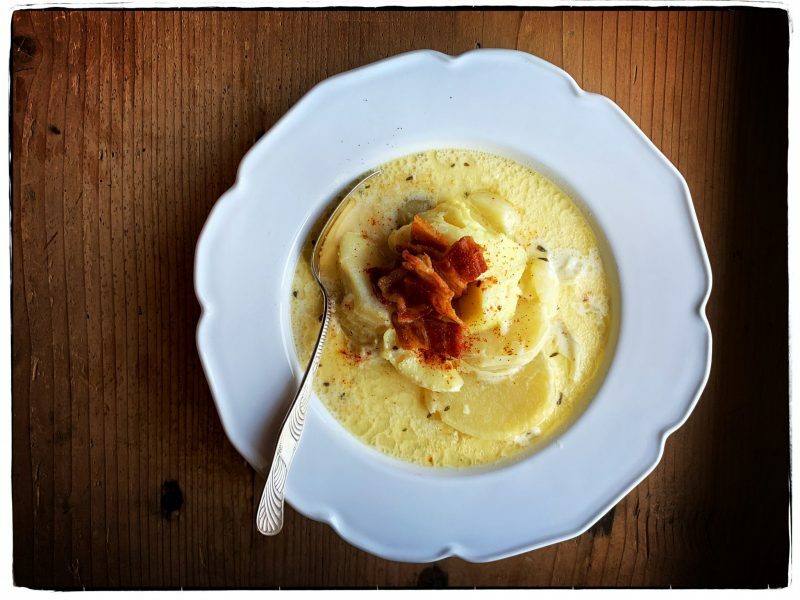 In the meantime, we haven’t tired of potatoes and onions, so today we added codfish and crisp bacon and lunched on bowls of luscious chowder—just the right choice for this lovely day. Our families and longtime friend Rick L. gathered together yesterday for a bonafide St. Paddy’s Day corned beef and cabbage dinner. On Saturday, we simmered the ten pound corned beef brisket on the stove all afternoon. On Sunday, just before dinner, we poached all-purpose spuds, spring onions, carrots, marble-size Brussels sprouts, and the requisite cabbage in the flavorful corned-beef broth and served platters of the sliced meat and vegetables with a delicious parsley white sauce. 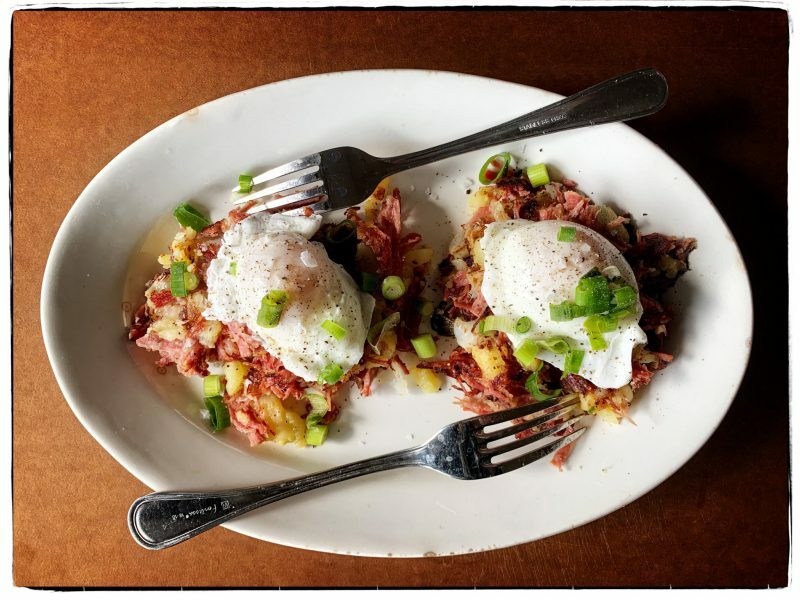 As satisfying as all that was, we nonetheless had our eye on today’s lunch: corned-beef hash topped with poached eggs. Next to day-after-Thanksgiving turkey sandwiches, is there anything better than corned beef and cabbage leftovers hash? We’re getting our greens in today with this string bean, escarole, scallions, and pea soup studded with poached chicken. Chopped fresh parsley, mint, and chives get honorable mentions for contributing their herbaceous verdancy. Sure feels like spring today. Remember to cook something delicious for yourselves, dear friends. 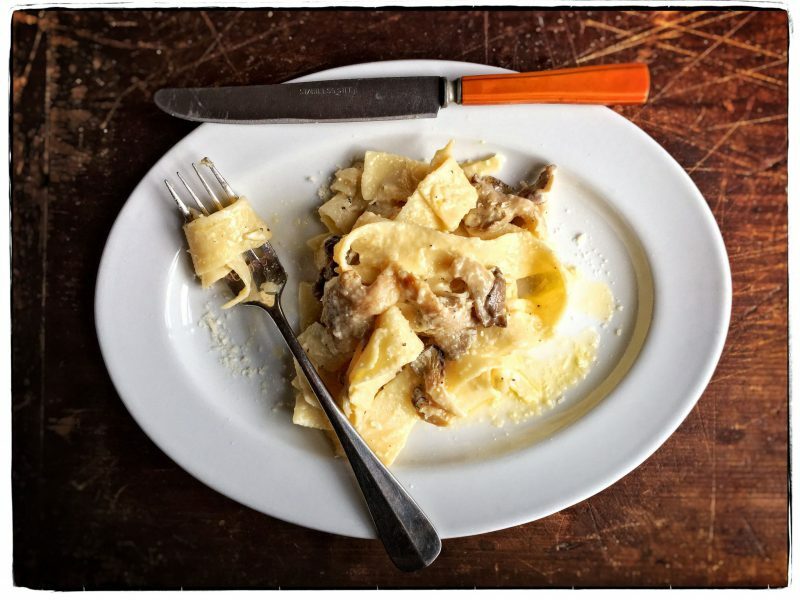 Our lunch today: plates of oyster mushrooms stewed in butter and cream served in a tangle of pappardelle bathed in cream (yes, more cream) and seasoned with finely grated lemon zest, parmigiano, salt and pepper. For dessert, we had tiny second helpings. A cold breezy day today but the sun is shining strong and warm. A perfect nearly spring day. For lunch we made a chunky roast chicken salad with mayo, olive oil, lemon juice, Dijon mustard, chopped fresh mint and chives, and s & p and served it on baby romaine leaves with sliced avocado and deviled eggs. But sadly we ate it before we could photograph it! 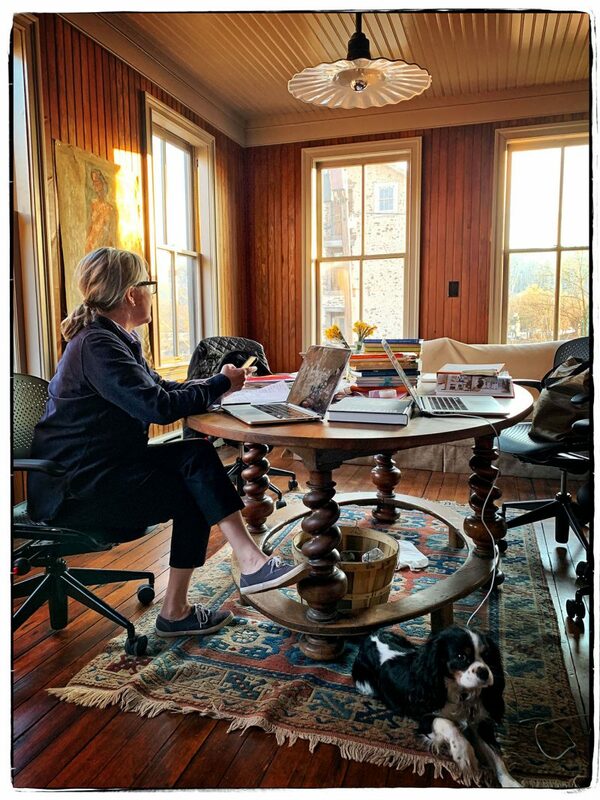 Instead we are sending you a picture of MH and Bob, the studio dog, (in our new aerie of an office) who both ate said chicken salad only a few minutes earlier. 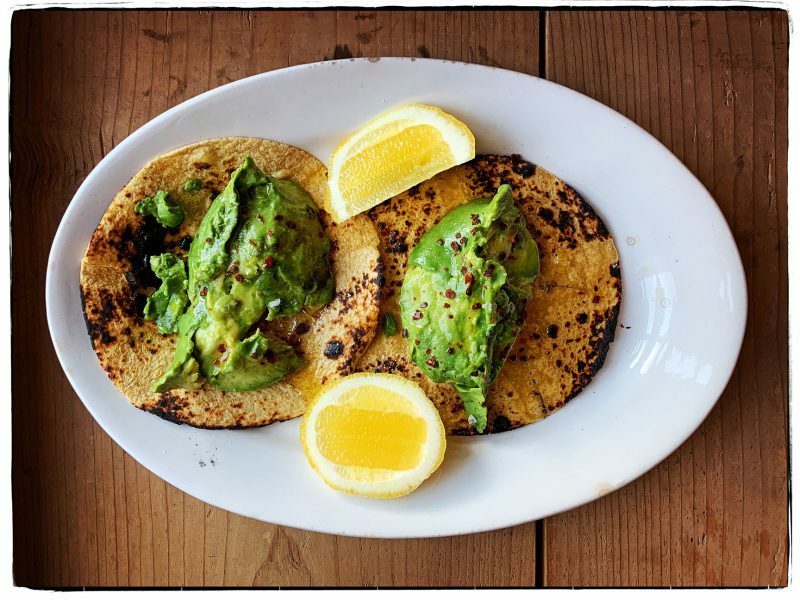 We bought a few firm Hass avocados at the market last week, and today they are perfectly ripe for our fire-toasted corn tortillas. We served these for lunch, with a splash of good olive oil and a squeeze of lemon juice, seasoned with Maldon sea salt and Marash red pepper flakes. Forgive us avocado toasts, we are seeing tortillas on the side. We know it’s not right, but we just can’t help ourselves. 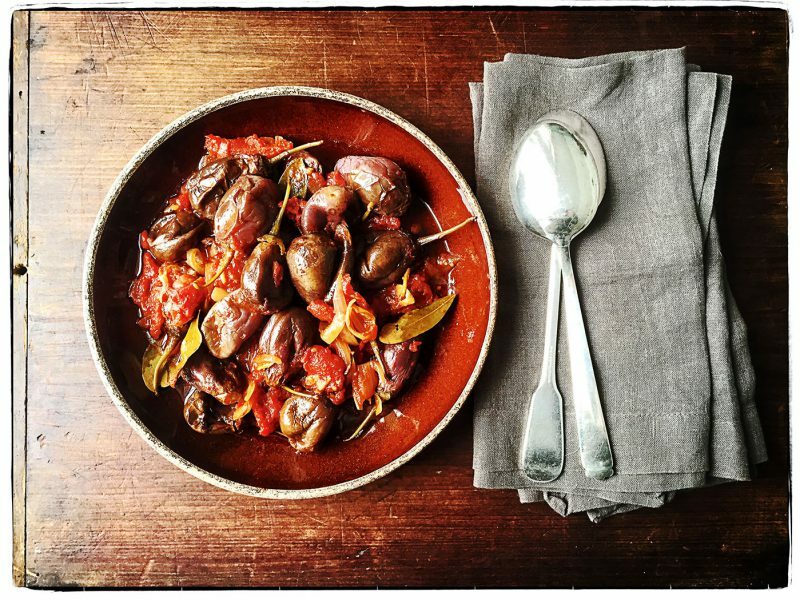 We have been relying on these little hot-house tomatoes in our salads to get us through the starkness of winter. 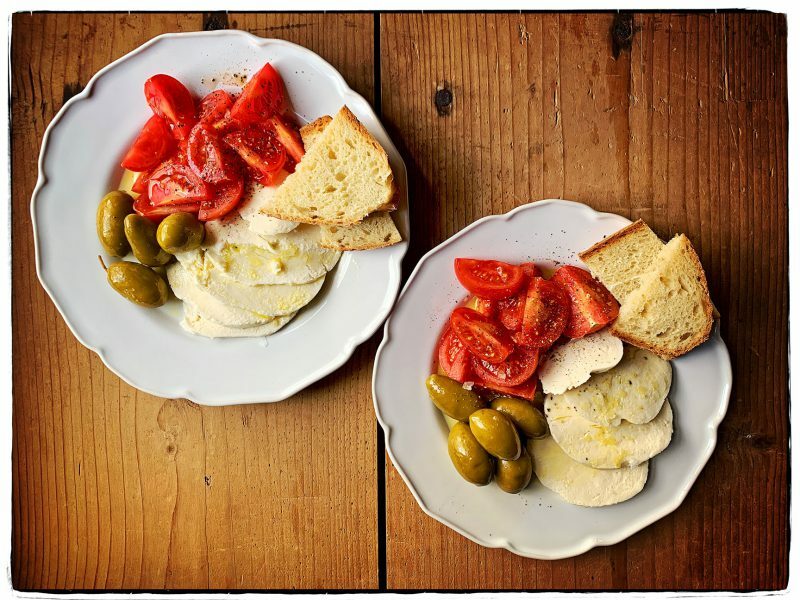 They certainly do the trick of adding some sweet-bright juiciness to today’s lunch plate of sliced fresh mozzarella and meaty green castelvetrano olives seasoned with a generous splash of extra-virgin olive oil, some Maldon sea salt, and freshly ground black pepper. 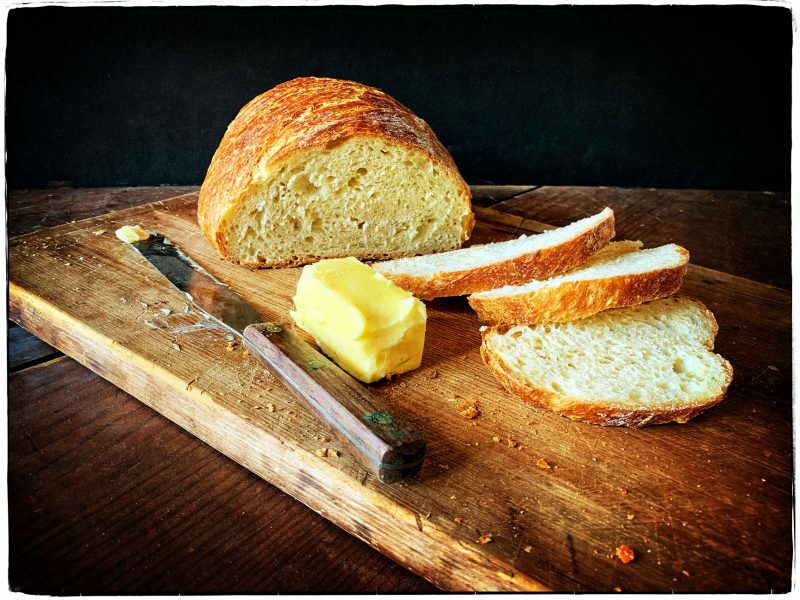 A lunch of homemade bread and good Irish butter. Remember to cook something delicious for yourselves, dear friends. We found these little eggplant at a wonderful Asian market in Ft. Lee, New Jersey. Thought we might make something with them to celebrate the Lunar New Year, but we ended up folding, pleating, and eating dumplings for days instead. Heaven. Now we’re back to braising, just the way to turn these cutie pie eggplant supple and tender. We hauled out our Le Creuset pot, and added the eggplant (they’re about the size of a golfball). Then we added a can of whole peeled tomatoes and the water we used to rinse out the can (about 1 cup), a sliced onion, and a couple of crushed garlic cloves. We spiced things up with red pepper flakes, bay leaves, salt, and some glugs of olive oil to add richness. We covered the pot and into a 300°F oven it went to braise until the eggplant had collapsed into the saucy juices. It’s one of those dishes that could be served hot over rigatoni topped with crunchy bread crumbs, but we ate it for a dainty lunch today, served at room temperature with some hard-boiled eggs. Happy New Year, dear friends. We’ve been, like college kids on Winter Break, away from the studio since just before Christmas. We ate well over the holidays, but not so much that we feel the need to go on a post-holiday cleanse. What punishment that would be when it’s so cold outside and all our bodies really crave is something warm, that fills our tums, and sticks to our ribs. 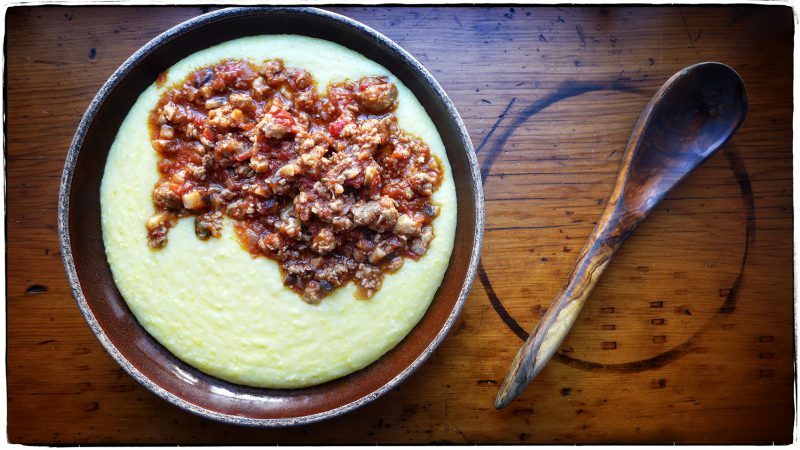 Today for example, a perfect lunch that does all three: chunky Italian sausage, mushroom, and tomato sauce spooned over soft, buttery polenta. 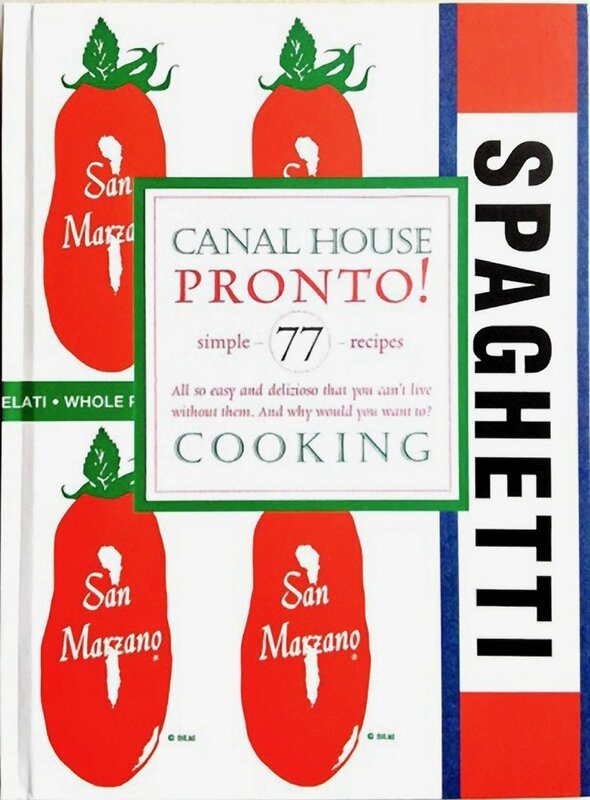 A “spag-bol” of sorts. We each started out with a dainty serving, then went back for thirds. Feels good to honor what your body asks for. We cooked a Christmas lunch for all the hard-working, talented men who have been transforming The Canal House Station in our new home. Normally, they eat in the midst of scaffolding, ladders, and saws but we hid all the boxes and general disarray of a construction site and set a nice table for them. We laid out relish trays with breadsticks, salami, prosciutto, olives, carrots, and celery. Then we served them lasagne Bolognese and garlic bread, followed by a chicory salad with orange segments and fennel. It was sea salt caramel and Madagascan vanilla gelato with Christmas cookies for dessert. It was a big success on all sides. 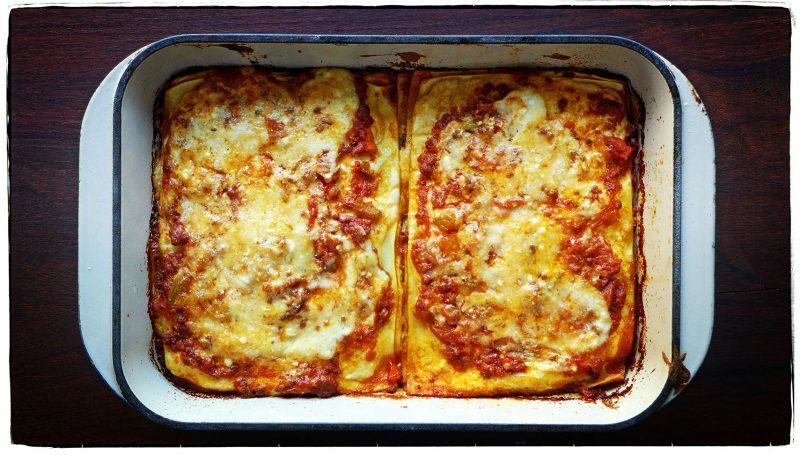 We ate our lasagne in the kitchen. Then we did the whole thing over again for the Early Bird Espresso & Mercantile team’s Christmas dinner. As always the giving is always better than the getting. Cook something delicious for yourselves this holiday weekend, dear friends.